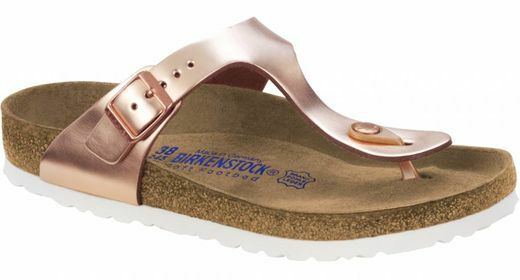 This fashion item belongs to one of the classic Birkenstocks. 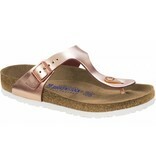 Fashion and functionality go hand in hand with this sandal because the reflective metallic finish steals the show. Also, we have to bring your attention to the anatomically shaped cork/latex footbed with coating of suede. The model has a leather top and an extra soft footbed. Thanks to the metal buckle, the slipper can easily be adapted to the foot. The Gizeh metallic copper is available in the width 'normal'.